Create cold call scripts for Sales Appointments starting with an Introduction Stage that prevents early objections and makes prospects listen to your story. Make prospects listen and move with you to the next stage because your script uses your words and is specific to you and your products. Stop early objections, and excuses, by using potential benefits in your Introduction to show the prospect what they could gain by listening to you. Enjoy making appointment cold calls and have a confidence that shines through in your voice by knowing what to say and do at all times. Have a full diary of appointments because you know how to move prospects forward from the Introduction through the stages of a call and gain their agreement to a meeting. The training focuses on creating a cold call script because they're the most difficult calls to make. The techniques are also effective on all other types of appointment calls, including: follow up calls, repeat customers, and responding to warm leads and incoming enquiries. What an Effective Introduction Should Have? You – Name, Position, Title, Specialization. The Company – Name, Group Name. About the Company – Description, a feature, and a benefit. The Reason for the Call - A potential benefit to the prospect. It’s important to make a conscious decision on the best way to introduce yourself to your prospects. Decide if you will use just your first name or first and second. Your choice will depend upon how formal you want to sound and the level of the prospects you are contacting. The etiquette and customs of the country the prospect resides in may also influence your choices. The other choices you have to make are on the words just before you announce your name, and any title or position you want to add. Are you going to use: My name is... or, I am... or other words. And will Mr or Mrs be right for your prospects, and will you use your position in the company to show your authority or credibility. 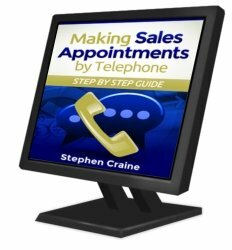 I’ve trained successful telesales people and appointment makers for over two decades and the choices I’ll highlight on this page for you to make are very important to the success of your cold call script. When you think about and choose the words you will use in your Introduction you will already start to feel more confident because you know what you are going to say. If you just state the name of your business will prospects know your company or your products? In the early stages the prospect is looking to make connections between what they know and what your call is about. You must give them familiar points of reference to make those connections. If you work for a famous well known brand, such as Microsoft or Google, then they will probably know about the products you sell. But what if your business is a name they have never heard before? If your products are recognizable they will make the connections. Even if they don’t recognize your company name they will start to build a picture of you and your products. If you sell a new type of product, or one that your prospects are not familiar with, you need to add a point of reference. Add something about what the product does, or connect it with a product or process they may currently use that your product could replace. What you don’t want to happen is two minutes into the call the prospect still doesn’t know who you are and why you are calling. The above two sections of a call take only a few seconds to complete but they can have a real impact on the success of the call, it’s up to you to make choices that result in that impact being positive. Your appointment cold call script so far - In the sections above you have chosen the lines you will use to introduce you and your company. If you leave it at that the prospect may listen to you. But they may give you a smoke screen objection. This is because up to now you haven’t grabbed their attention. The way you grab their attention using a cold call script is by using potential benefits that may be of interest to them and that they may be able gain. The first benefit you use in your calling script is in relation to your company and what you sell or do. You need to choose a big, wide open, potential benefit that you offer customers and that may be appropriate to the prospect you are talking with. This should form the next line of your appointment call script. To help you, think about your business angle, are you the cheapest, the most reliable, local, worldwide, or most experienced. Do you have a unique product or service, can you give the prospect something they don’t currently have, or can you solve a problem they may currently have. In all my sales training I stress that the reason you are calling is the most important line of the call. It doesn’t matter how good your sales skills are, or how well you can gain agreement to a sales meeting, if you don’t have an effective reason for calling you will not get to the stages where you can use those skills. Let me start by telling you about one line you shouldn’t use as a reason for calling a prospect to arrange a sales appointment. Your reason for calling must show potential benefits for the prospect because that motivates them to keep listening to you and to possibly want to meet with you. Being in their area on a certain day doesn’t give any potential benefit to the prospect, it’s just seen as saving you travelling time. Would the benefit you have chosen to complete the line above grab the listener’s attention and make your call important enough for them to give you more time? As we discussed in the previous section, there will be a feature of your products or services that could give the prospect a potential benefit. A good example is where you can offer very good discounts for orders over a certain size. Your reason for calling is: because you may be able to offer discounts (feature) which could save the prospect money on some orders (benefit). Choose a feature of your service and a related benefit that you think will grab the attention of the buyer. Give them a reason to want to know more, that’s your only objective at this stage of the appointment call. Want to Know if Your Reason for Calling is Effective? We’ve only covered the first seconds of a sales appointment call and already you can see that there are a lot of choices to make to select the best words for your cold call script. To help my sales teams to choose the best words, and get the best possible results from their calls, I developed a sales training course to present to them. This course has been used by the teams I’ve managed and trained for small businesses and international organisations. It takes you through an exercise program that helps you to create a complete appointment script specifically for your products and services. This has helped many sales people and teams to have a constant flow of meetings with qualified prospects and it can help you to achieve the same success. The Introduction we have discussed on this page is the first stage of a sales appointment cold call script. Use proven examples of reasons for calling to create your Introduction Stage.